BIZ COOL 89% Nylon, 11% Elastane, 4 Way Stretch fabric. Power stretch performance fabric with internal sports bra. Racer back with mesh paneling for enhanced breathability. Longer body length with shaped flat-locked seams. 310 GSM. Colours: Black/Magenta | Black/Cyan | Black/Black | Black/Lime. 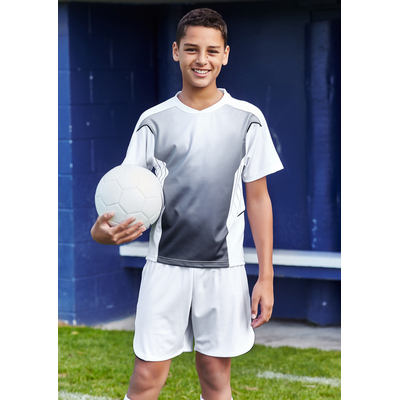 100% BIZ COOL Polyester Sports Interlock. Grid mesh underarm panels for breathability. Unique shoulder print feature. Contrast panels and piping. V-Neck and armhole binding. Racer back and shaped styling. 155 GSM. UPF rating - Excellent. Colours: Ash/Black | Navy/Sky | Navy/White | Red/White | Royal/White | Black/Red | Black/Gold | Grey/Fluoro Lime | Black/White. BIZ COOL 100% Breathable Polyester. New generation mesh. Self fabric binding at neck and armhole. Added bust darts for shape. Racer back. 145 GSM. UPF rating - Excellent. Colours: White | Black. BIZ COOL 100% Breathable Polyester. New generation mesh. Self fabric binding at neck and armhole. 145 GSM. UPF rating - Excellent. Colours: White | Black. 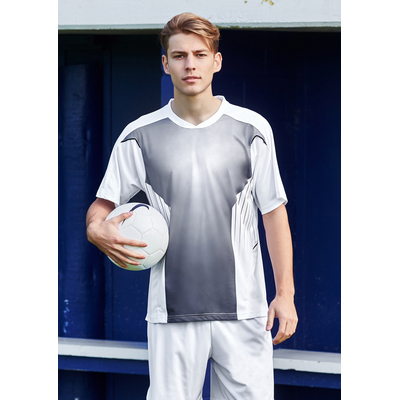 100% BIZ COOL Polyester Sports Interlock. Grid mesh underarm panels for breathability. Unique shoulder print feature. Contrast panels and piping. V-Neck and armhole binding. 155 GSM. UPF rating - Excellent. Colours: Black/Red | Ash/Black | Black/White | Navy/Sky | Red/White | Royal/White | Black/Gold | Grey/Fluoro Lime | Navy/White. SIZES: 8 - 20. FABRIC: 95% Cotton, 5% Elastane Stretch fabric. 190 GSM. UPF rating - Excellent. FEATURES. Fine edged V-Neck binding. Longer length and cap sleeve. Available in Black only. BIZ COOL 100% Breathable Polyester. New generation mesh. Crew neck with self fabric. Durable flat lock raglan armhole. 145 GSM. UPF rating - Excellent. Colours: Spring Blue | Maroon | Forest | Gold | Red | Black | White | Royal | Navy. BIZ COOL 100% Breathable Polyester Single Jersey Knit. Snag resistant fabric. Contrast twin stripe on shoulder and curved panel from raglan curve to back of singlet. Self fabric binding on neck and armhole. Racer back. Side splits. 165 GSM. Colours: Ash/Black | White/Black | Black/Red | Black/White | Red/White | Black/Gold | Forest/White | Royal/Gold | Hot Pink/Black | Maroon/White | Royal/White | Sky/Navy | Navy/White. Mens Flash Singlet. BIZ COOL 100% Breathable Polyester Single Jersey Knit. Snag resistant fabric. Contrast twin stripe on shoulder and curved panel from raglan curve to back of singlet. Self fabric binding on neck and armhole. Side splits. 165 GSM. Colours: Black/Red | Navy/White | Ash/Black | Red/White | Royal/White | Black/Gold | White/Black | Sky/Navy | Maroon/White | Forest/White | Black/White | Royal/Gold. Kids Flash Singlet. BIZ COOL 100% Breathable Polyester Single Jersey Knit. Snag resistant fabric. Contrast twin stripe on shoulder and curved panel from raglan curve to back of singlet. Self fabric binding on neck and armhole. Side splits. 165 GSM. Colours: White/Black | Ash/Black | Red/White | Royal/White | Black/Gold | Black/White | Sky/Navy | Black/Red | Maroon/White | Forest/White | Navy/White | Royal/Gold. Mens Splice Singlet. BIZ COOL 100% Breathable Polyester Mesh Knit. Contrast side panel singlet. Contrast splice detail on singlet shoulder. 160 GSM. UPF rating - Very Good. Colours: Royal/White | Black/Orange | Black/White | White/Navy | Red/White | Black/Gold | Navy/White | Royal/Gold | Fluoro Yellow Lime/Black | Navy/Gold | Spring Blue/Navy | Navy/Red | Black/Red | Forest/Gold. 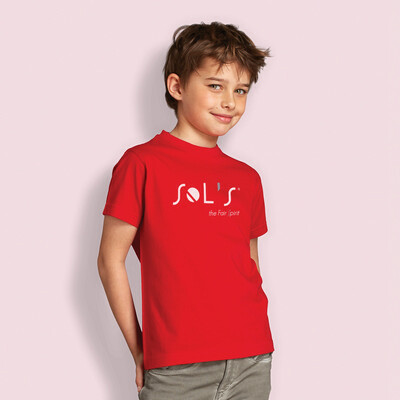 Kids Sonic Tee. BIZ COOL 100% Breathable Polyester. New stretch sports interlock fabric. Sublimated tonal front panel. Contrast piping insert detail. Self fabric overlapping crew-neck. 155 GSM. UPF rating - Excellent. Colours: Emerald | Red | Maroon | Gold | Royal | Navy | Black | White. BIZ COOL 100% Breathable Polyester. New generation mesh. Crew neck with self fabric. Durable flat lock raglan armhole. 145 GSM. UPF rating - Excellent. Colours: Gold | Spring Blue | Maroon | Forest | White | Royal | Red | Navy | Black. 95% Cotton, 5% Elastane Singler Jersey Knit. Scoop neck style. 180 GSM. Colours: White | Red | Green | Cyan Blue | Purple | Magenta | Black. BIZ COOL 100% Breathable Polyester Single Jersey Knit. Snag resistant fabric. Contrast twin stripe from shoulder to sleeve cuff. Contrast curved panel from raglan curve to back of tee. Side splits. 165 GSM. Colours: Black/Red | Royal/Gold | Red/White | Ash/Black | Forest/Gold | Navy/Red | Black/White | Royal/White | Maroon/White | Sky/Navy | Forest/White | Black/Gold | White/Black | Navy/White | Navy/Gold. 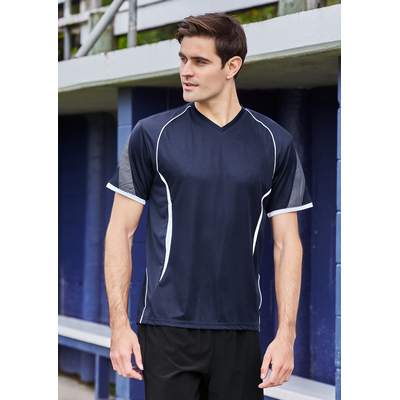 BIZ COOL 100% Breathable Polyester Single Jersey Knit. Snag resistant fabric. Contrast twin stripe from shoulder to sleeve cuff. Contrast curved panel from raglan curve to back of tee. Side splits. 165 GSM. Colours: Navy/White | Forest/White | Forest/Gold | Navy/Gold | Navy/Red | Sky/Navy | Maroon/White | Royal/White | White/Black | Ash/Black | Red/White | Black/Red | Royal/Gold | Black/White | Black/Gold. SIZES: S - 2XL. 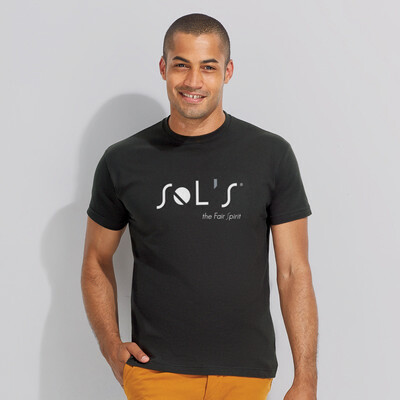 FABRIC: 95% Cotton, 5% Elastane Stretch fabric: 190 GSM: UPF rating - Excellent. FEATURES: Fine edged V-Neck binding. Available in Black only. SIZES: 4 - 16. FABRIC: 100% BIZ COOL Polyester Sports Interlock. 155 GSM. UPF rating - Excellent. FEATURES. Grid mesh underarm panels for breathability. Unique sleeve print feature. Contrast panels and piping. Self-fabric V-Neck binding. 95% Cotton, 5% Elastane Single Jersey Knit. 180 GSM. FEATURES: Classic sleeve and body length. Wide V-neck binding. Colours: White | Red | Black. SIZES: S - 3XL, 5XL. 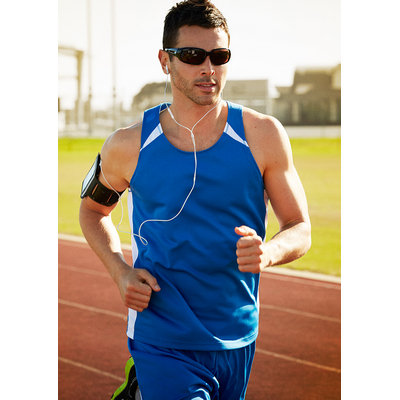 FABRIC: 100% BIZ COOL Polyester Sports Interlock. 155 GSM. UPF rating - Excellent. FEATURES: Grid mesh underarm panels for breathability, Unique sleeve print feature, Contrast panels and piping, Self-fabric V-Neck binding. SIZES: S - 2XL. FABRIC: 95% Cotton, 5% Elastane Singler Jersey Knit. 180 GSM. FEATURES. Crew-neck with twin stitched sleeves and hem. Available in Black, White only. 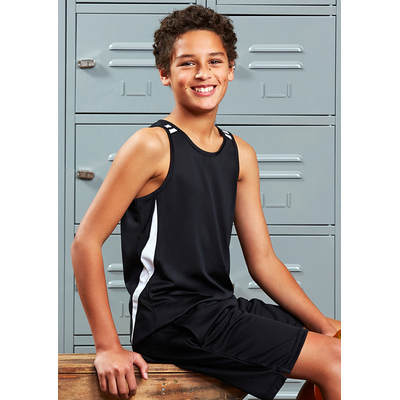 Kids Sprint Singlet. BIZ COOL 100% Breathable Polyester. New generation mesh. Self fabric binding at neck and armhole. 145 GSM. UPF rating - Excellent. Colours: White | Black. Ladies Sprint Tee. BIZ COOL 100% Breathable Polyester. New generation mesh. Crew neck with self fabric. Durable flat lock raglan armhole. 145 GSM. UPF rating - Excellent. Colours: Spring Blue | Maroon | Forest | Gold | Red | Royal | Black | White | Navy.